My initial thought (or, at least one of them) when first checking out Miami Athletic Club was, “This is one of Cincinnati’s best kept secrets”. In fact, that’s exactly what I told Scott, the owner, after I signed up that same day. I was, and continue to be, impressed with what MAC has to offer: all the way from the wide variance in exercise machines, weights and classes to the sauna, pool and friendly staff. I was introduced that first day to the Keiser air machines. I did not know such a thing existed. These are state-of-the art strength/ body building/exercise machines. Top notch. With all that MAC has to offer, there is literally something for everyone, and every goal. It was the Live O2 oxygen therapy, however, that has blown my mind. 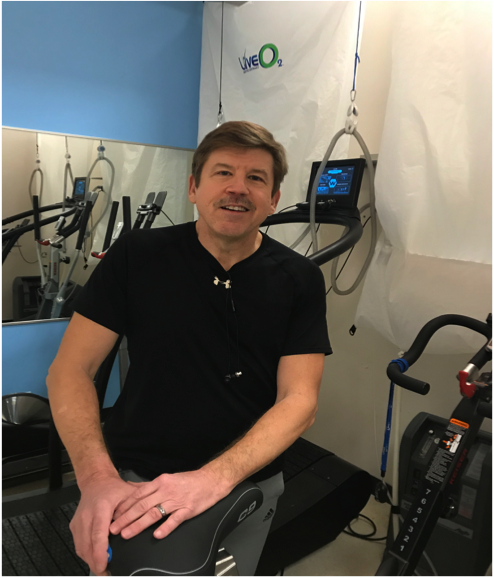 Scott began telling me about some of the benefits of oxygen therapy, and what it could do. I had never heard of this before either, and started doing my own research. The more I read and learned, the more interested I became. I decided to try it. What began to happen next I can only describe as life altering, and what appears to be life changing. I have several chronic medical conditions (I am 59 years old): diabetes, high blood pressure, chronic fatigue, frequent waking to name some. I started out doing the oxygen therapy at MAC three times a week. The results have been incredible—and quickly. I started having more energy (I’ve had chronic fatigue issues for probably 30+ years). Nothing has ever seemed to help like this. That alone got my total attention. But there’s more, much more. The Live O2 oxygen therapy also appears to be helping my diabetes blood sugars, my sleep, my blood pressure. I’ve got healthier skin color in my face. My workouts are stronger, and I seem to be able to lift more weight after oxygen therapy. My sense of smell is even better after oxygen treatment.